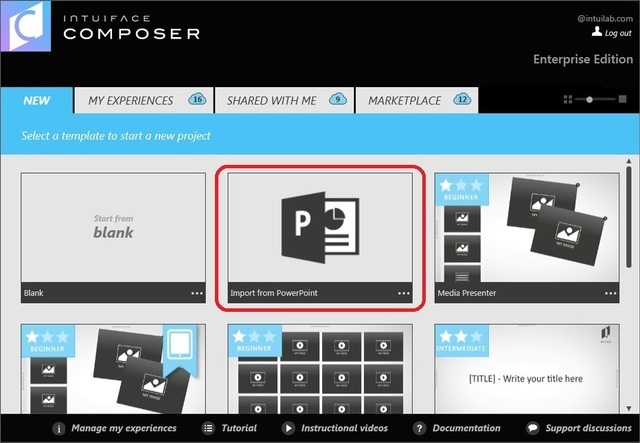 If your need is to simply interact with and browse an existing slide deck, you have the ability to choose the "Import from PowerPoint" option in Composer's Experiences panel. The import process takes a snapshot of each slide and turns that image into the background for a scene. No individual elements, videos, or animations of a PowerPoint presentation are retained. If you want to copy individual text boxes or images into an Intuiface experience, see this article. Microsoft PowerPoint 2007 or later must be installed on your computer to enable the conversion of PowerPoint slides into Scenes. If you needed to install Microsoft Office, be sure you reboot the computer when the installation completes, enabling Microsoft Windows to register all PowerPoint file extensions. Ater selecting the "Import from PowerPoint" option, you will then be asked to create a project into which the slides will be added. Note the ability to choose a target screen resolution. Here you can choose any display size with a 16:9 ratio. For most Windows displays, the first option - Full HD - is suitable.